I managed an okay morning of work, but by early afternoon I was back to glancing out the window every few minutes. Bright sunshine, white puffy clouds, and the sky was a piercing shade of blue that one only sees at these clarifying altitudes. It was really too perfect of a day not to go exploring by bike, so I set out from our friends' house with a borrowed Trek 4500. Trek 4500 was an okay steed; she reminded me of my first mountain bike, which was a Trek 6500. But she was also a strong reminder of why I used so many resources to continue to trade up over the past decade — heavy, not well fitted, and the drivetrain had some issues. These issues probably went unnoticed in her regular role as a commuter, but as soon as I started up the Peaks Trail, the sluggish shifting, missed gears, and manic chain dropping became a liability. Any time I applied even the slightest increase of pressure on the pedals, the chain either locked up or went flying, and a pedal reliably ended up embedded in the back of my leg. I swore at this bike more times than I'd like to admit, and finally relented to stepping off and walking over any obstacle larger than a small pebble. 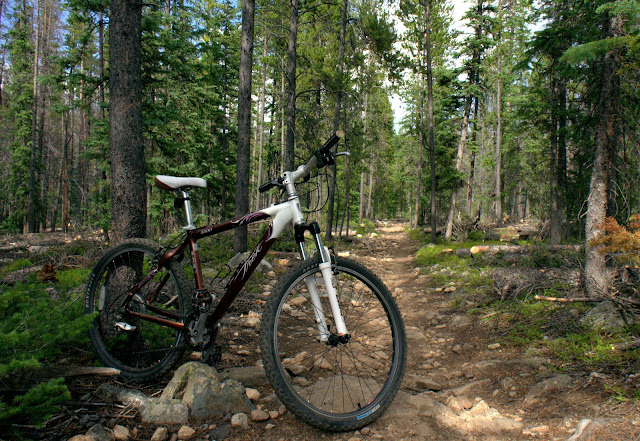 I'd planned to ride the fun Peaks Trail to Breckenridge, but the climbing rapport between me and the Trek 4500 was so poor that after five miles I was looking for good places to abandon the bike and continue on foot. 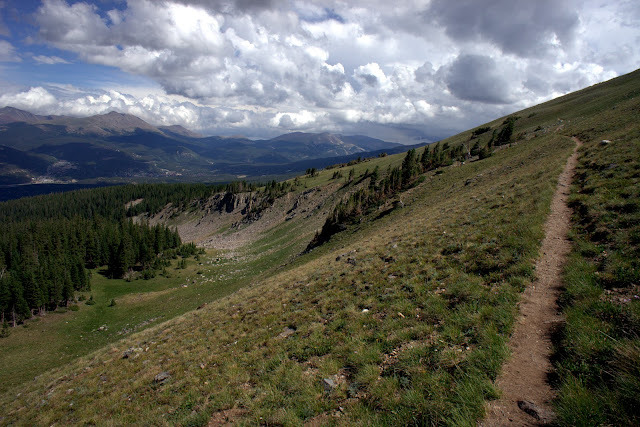 I came to the Miner's Creek Trail and decided to veer off the planned route, knowing that while the Peaks Trail had the key properties for a fun ride (gentle grades key among them), it would likely make for a boring hike. I rode Trek 4500 about three quarters of a mile up the trail until I came to a creek crossing, and shortly after that, a trail marker for the Colorado Trail. "This is the Colorado Trail?" I thought. "I definitely don't want to try to ride a rickety bike up this." The trail was chunky and steep, but not so much so that I couldn't try to push the pace a little. I'm adjusting to the altitude, somewhat, and thought I could handle some running. Because of my shin splints, it's the first time in three weeks that I've attempted a running stride. It almost seems like the thin air is aiding in healing as well, because despite the hard hikes over the weekend and rather abrupt return to jogging, I experienced minimal soreness today. 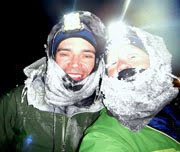 The trail crested a saddle and launched into a long traverse at 12,000 feet — scenic, warm, blissfully runnable. My lungs were on fire at times, but the motion of free running felt so good that I chose to ignore painful breathing and just fly. Of course I wasn't actually flying — I wasn't even running fast. But the simple freedom from pain can feel liberating, as can releasing myself from the annoying complications of a machine ... even one I love, like a bike. I will concede that this singletrack traverse would make for a blissful ride as well, but the 2,000 vertical feet of steep chunk to reach it ... not so much. This basically supports the opinion I'd formed about the Colorado Trail before I even saw an inch of it. Riding the whole trail would likely be a fine blend of Heaven and Hell, with very little in between. Honestly, I need that in between to sustain my sanity during a good tour. I need the ability to zone out. I'm not a strong technical rider (understatement), and even if I continue working on that (I am), I don't think I would enjoy sustaining the focus required for hours and hours, every single day. I had *a lot* of fun descending Peaks Trail, even on the Trek 4500. But that's mountain biking. 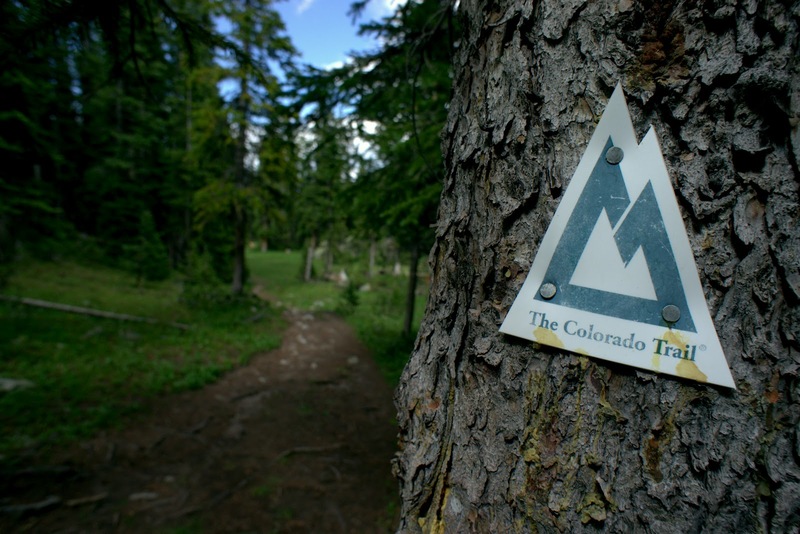 As a tourist, I suspect I would love the Colorado Trail in pieces, and resent it as a whole. I've long wanted to tour the Colorado Trail, but I'm reaching the conclusion that if I ever do try, it's going to be on foot. Backpacking. Or fastpacking, really. Because it could be a lot of fun to occasionally run, from what I've seen. I will backpack the Colorado trail with you. I've backpacked parts of the Colorado Trail - it's awesome. Nice. Those trails along the Tenmile Range are some of my faves within an hour of home. Usually run 'em, but biked Peaks for the first time a couple of weeks ago, and my front shock got a workout. Some of it was above my pay level because I'm not that great of a mt. biker yet. 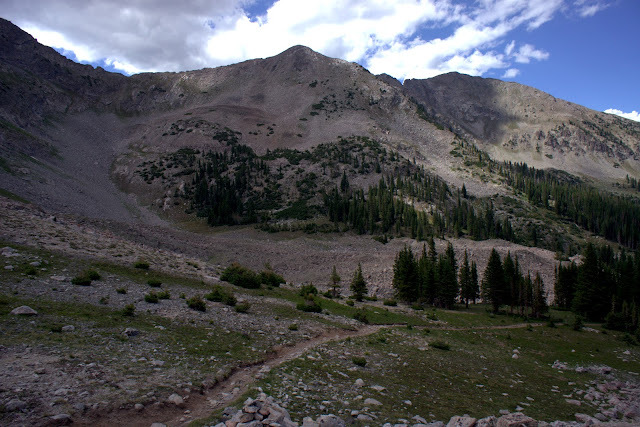 And the section of the CO trail between Peaks and treeline is steep. Heck, I only run about 1/2 of that. You might try the CO trail on the east side of Highway 9. Once you get above the switchbacks you can see from the road, it's really nice lodgepole pine forest. Finally catching up on your blog after it was blocked at work for awhile. I could've loaned you my Niner if I'd read this earlier! It's not the best bike, but it shifts like a dream. Hope you've enjoyed your time here (definitely looks like you have). How is Keith doing now? Interesting blog. One thought on the bike: You should always give the drivetrain a quick once over to make sure the derailleurs are in good form before you head out, especially on a stranger's bike. The 4500 is equipped well enough that tuned you shouldn't have issue. If you don't know how to tune there are numerous resources on the easy process. And of course it doesn't fit well, it's not your bike. While the frame isn't the hottest material, the geometry is identical to Trek's top end XC hard tails. Anon: All good points. The drivetrain fix was probably relatively simple, a matter of adjusting cables, but I admit I had neither the time nor patience to deal with it before my short ride — just took a chance knowing I could always do something different if the bike didn't work out, which is what I did. I didn't mean for this post to be interpreted as a slam on the 4500. I don't write specifically about gear on my blog for this reason — because all gear choices are highly subjective.